Lilium Santorini Villa – The style and luxury really shine through at this 5-star offering – thanks in part to its dramatic clifftop location, boasting uninterrupted sea views. There’s a sumptuous infinity pool to chill out in, surrounded by sun loungers and umbrellas – all of it is super design led. Elsewhere, you’ll find a spa and a beautiful restaurant, with a terrace where you can enjoy meals with a view. As an extra bonus, not only is there free parking and a free breakfast buffet, but also free laptops for guests to use! Astro Palace Hotel & Suites – Let yourself unwind in the sumptuous surroundings of this hotel as you lap up sweeping views of the Aegean Sea from the comfort of your balcony. Some rooms even come with their own Jacuzzi, while others look out onto a private pool. The hotel is decorated in simple, pastel colors to create a luxurious, relaxing atmosphere that seamlessly blends into the natural landscape. Guests can fully immerse themselves in the laid-back elegance by choosing one of the in-house spa treatments or simply swimming in the large outdoor pool. Santorini Palace – Sea views and sun-soaked terraces, this hotel combines classic Santorini style with sleek furnishings to create a comfortable and chic place to stay. Rooms are modern and clean and either look out across the garden or the sea. There are some amazing views of the iconic caldera from the front of the property, which is a fantastic and uncrowded place to watch the sunset. 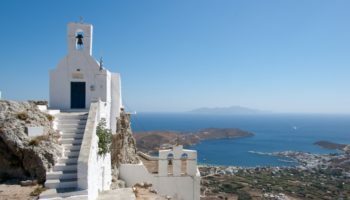 All the interesting streets of Fira are just on the doorstep, which makes it a great spot for exploring the nearby sights, such as the Archaeological Museum of Thera and the Megaro Gyzi. Dream Island Hotel – A beautiful resort consisting of whitewashed buildings set around a chilled pool area, Dream Island Hotel features sleek rooms complete with their very own balconies (or terraces) – and some of these have wonderful sea views. It’s a two-kilometer walk to the seaside, perfect for those who like to be active and get outside. The breakfast is free and so is the airport shuttle, making this 3-star hotel extra convenient. 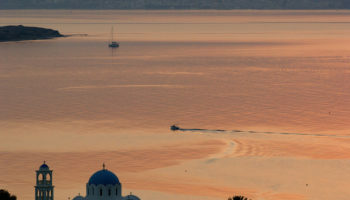 Oia’s divine sunsets, sleepy nightlife and an artistic atmosphere is a big attraction to the many people who come here. 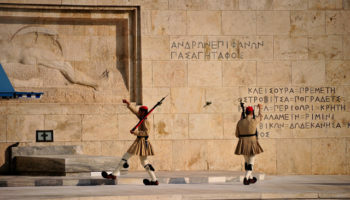 The village’s serene vibe is appealing to those who want to stay close to the main transit hub of Fira, but don’t want to be in the middle of the action. 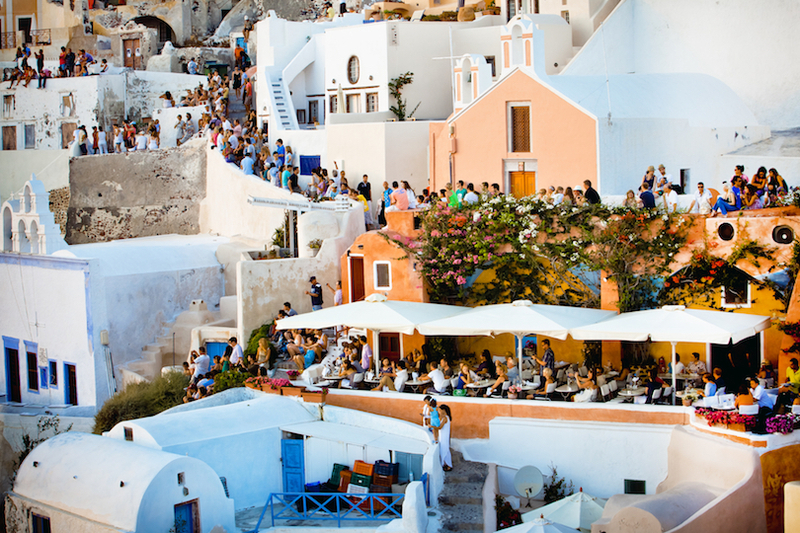 Situated on a steep slope of the caldera, Oia’s big draw is its sundowners: people gather in the village every evening in order to bask in the famous Santorini sunset. The glorious views from Oia of the sun sinking below the horizon does means that it gets busy at dusk, although the visitors soon slip away as night falls and Oia returns to its peaceful pace of life once again. The stunning sunset views do come with a price tag, however, and accommodation in the town isn’t the cheapest. The village is home to a lot of 5-star luxury hotels and is often the top choice for newlyweds visiting the island on their honeymoon. 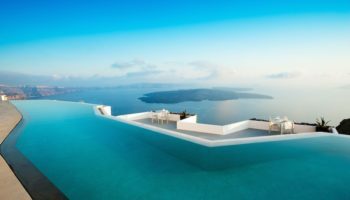 Katikies Hotel – Set up high on rocky cliffs above glistening waters of the Aegean Sea, this is the ideal simple spot to chill out and enjoy the beauty of Santorini. Rooms are based on traditional Cycladic architecture with whitewashed curved walls; you can sit on your private terrace watching boats pass by and the sky change color over the caldera. Staying in the utterly stylish, chic rooms feels like having a secret slice of Santorini to yourself. Uninterrupted views, private terrace pools, three amazing infinity pools, and two restaurants all add up to a luxurious stay. Anemoessa Villa – Located on the edge of Oia, this family-run hotel is a quiet and unfussy place that’s perfect for sunset views and poolside drinks. Calm and laid back – but close enough to the action that you can walk to the center of Oia village in no time at all – Anemoessa Villa is great for people who want to explore more of what the island has to offer; there’s a bus stop 50 meters away and the traditional Finikia village is only 20 minutes away. After an action-packed day exploring or lounging at the nearby Paradisos Beach, the very friendly staff will welcome you back to the relaxing hotel surroundings. Astra Suites – Peaceful, private, and with impeccable service, this hotel is the perfect place to wallow in the luxury and stunning seascapes of Santorini. The views across the deep blue sea from the balconies are enough to keep you glued to your seat for hours, but if you manage to tear yourself away from the amazing surroundings, staff will be happy to arrange a sailing trip or a tour. The hotel – with its beautifully contemporary yet comfortable interiors – feels like a secluded stay, but you won’t be isolated; the bars and restaurants of Fira are just two kilometers away. Andromeda Villas Resort Relaxed and simply stylish, Andromeda Villas boasts not only three pools (one features a pool bar), but also three restaurants; one of these is situated by the pool for glittery night time dining, and another is a refined option with high ceilings and chandeliers. Stay in a simple room with a sea view and balcony, or upgrade to a suite for your own private Jacuzzi or pool. Anassa Deluxe Suites – At this 4-star offering, you can either stay in studios – complete with their own kitchenettes, balconies, and simple, casual style – or suites that boast loft bedrooms and Jacuzzis. Once you’ve chosen your room, you can explore the nearby area (since you’ll be within walking distance of bars and restaurants), check out Kamari Beach – which is just a three minute walk away – or just kick back at the hotel and enjoy the pool, bar, restaurant, gym, sauna… and the complimentary buffet breakfast. Hotel Matina – Set in beautifully landscaped gardens, the whitewashed buildings of Hotel Matina provide the perfect setting for a sojourn to Santorini. You could lounge around the outdoor pool all day – swimming, sunbathing and then ordering a drink from the pool bar, or you could simply spend time relaxing after a day at the beach (five minutes’ walk away) in the chic, nautical-themed rooms on offer. And you can start your day the right way thanks to a complimentary breakfast buffet served up on a beautiful terrace – or in a high ceilinged dining room. Just a few kilometers away from the airport and another one of the cheaper places to stay on Santorini, Perissa is home to the famous black sand beach. 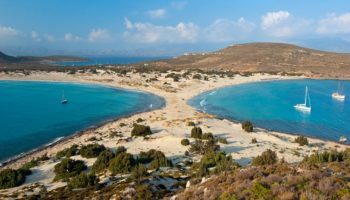 Lined with busy beach bars and a party scene, Perissa is a fun loving beach town to stay on your Greek getaway. There are plenty of activities to take part in, water sports to try out, and beach parties to enjoy with a cocktail in hand. Out of season Perissa is very quiet and many of the bars and shops are closed, so accommodation prices are considerably lower. You can explore the rest of the island from Perissa by renting a car or scooter, but a lot of visitors find themselves spending their days on the beach, soaking up the sun and the surf and evenings eating in the villages eateries and beach bars. Meltemi Village Hotel – This hotel calls itself a village, which is very fitting since it’s practically a village in its own right, with many different types of accommodation and covering a large area; the whitewashed buildings and seaside location really do make it feel like a self-contained Cycladic village! Choose to stay in a private villa with its own walled sun terrace and plunge pool, or stay in a standard room and enjoy the multiple pools at this 4-star hotel – one of these features three different water slides! The nearest beach is just a five-minute walk from here, too. Calm and quiet Firostefani boasts the famous Santorini caldera sunset views and impressive secluded private rooms, which come with an equally impressive price tag. Firostefani is within an easy twenty minute walking distance to festive Fira village, but is much more laid back. 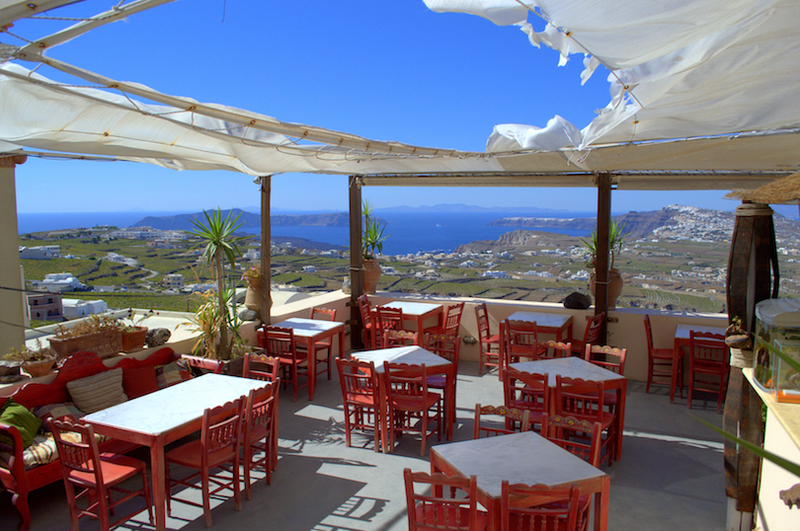 If you don’t fancy walking to neighboring Fira for dinner, Firostefani has its own delicious dining scene with plenty of restaurants and locally owned cafes that serve fresh food with fabulous views. Hotels in Firostefani are nestled among the charming colorful buildings and are centered around the main shopping street in the village, where visitors can buy most of the things they need on their vacation. Agali Houses – From its outdoor pool – complete with panoramic sea views – to its cafe and bar boasting not only a terrace but a library, too, Agali Houses is most certainly a place to come to unwind on Santorini. A range of rooms on offer – from standard rooms with private balconies to larger rooms with living areas, and even suites with their own hot tubs and plunge pools – means there are options for everyone, whether you’re traveling as a couple or with your family. Pyrgos (also known as Pirgos) is a little village on the highest point of Santorini and has incredible panoramic views across the whole of the island. 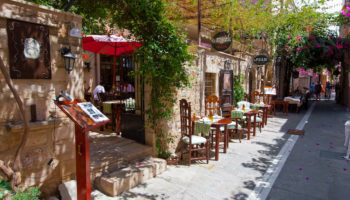 The village still has a traditional Greek feel, with a population of less than 1,000 and many old remains. Visitors to the village are charmed by the attractive winding lanes that lead up hillsides, past neoclassical mansions and authentic whitewashed houses and along sundrenched vineyards with views of unforgettable sunsets. The main square in the center of Pyrgos is where you will find the bus stop to travel to other villages. 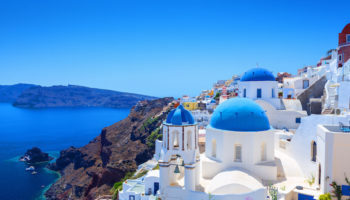 There are quaint galleries and churches which are waiting to be explored and, further up the hillside, small cafes where you can sip on cocktails and take in views of Oia and the blue seas below. Hotels in Pyrgos are varied and visitors can choose from luxury holiday homes, extravagant hideaways or locally owned hotels. Skyfall Suites – A boutique hotel featuring chic, luxury suites, Skyfall Suites is a great choice for couples looking for the perfect Cycladic getaway. It’s adults only here, meaning you’ll be able to relax in peace and quiet. The suites in the whitewashed surroundings of this 5-star offering feature private terraces – or balconies – and exquisite sea views, with decor that features stylish color pops in an otherwise minimalist design aesthetic. For food, there’s a beautiful restaurant complete with a rooftop terrace for a picturesque dining experience. 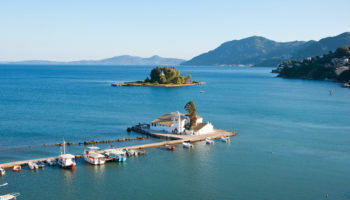 Megalochori is made up of magnificent mansions, rumored pirate dens, traditional Greek villas and wine caverns. Dating back to the 17th century, the photogenic village is one of the most charming on the whole of Santorini thanks to the local people’s effort to maintain and restore traditional buildings to their original state. Life in the village is based around the village square where you can linger over a coffee and watch the older inhabitants chat over a game of cards. 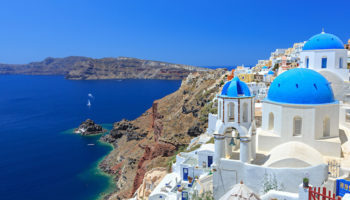 There are tavernas and shops as well as restaurants that serve up delicious dishes and busses can be caught to either side of Santorini from the main road. Accommodation around the village is made up of sophisticated hotels with a range of rooms available. Athermi Suites – Complete with views of Santorini caldera, true to its name, this hotel features rooms that are exclusively suites. They feature all the luxury you could wish for, from the beautiful driftwood-style decor and minimal style to the private pools and balconies that some of the more upscale suites offer. There’s also an outdoor pool complete with a pool bar. Thermi Beach and its black sands can be walked to in about 15 minutes, but if you want to get out and about on the island, book an excursion or two through this lovely hotel. 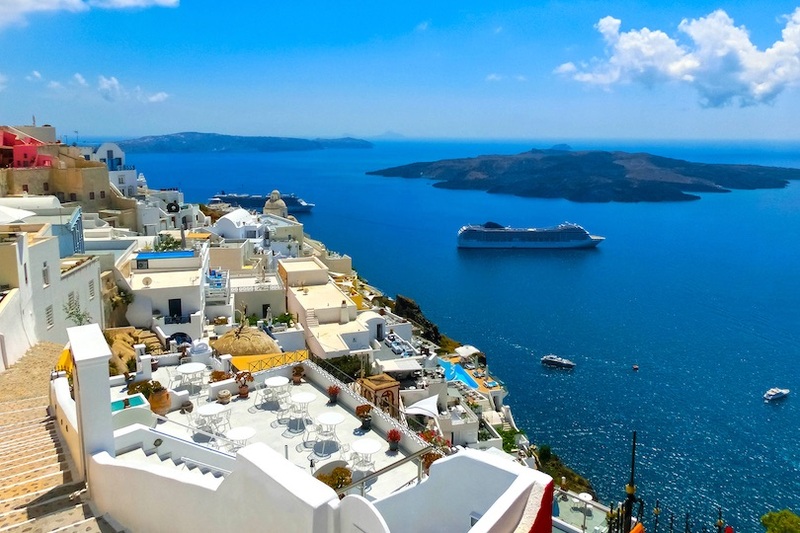 If you want to stay somewhere with the famous Santorini view of the Caldera, but don’t want to pay a huge amount for accommodation, then Akrotiri is your best choice. 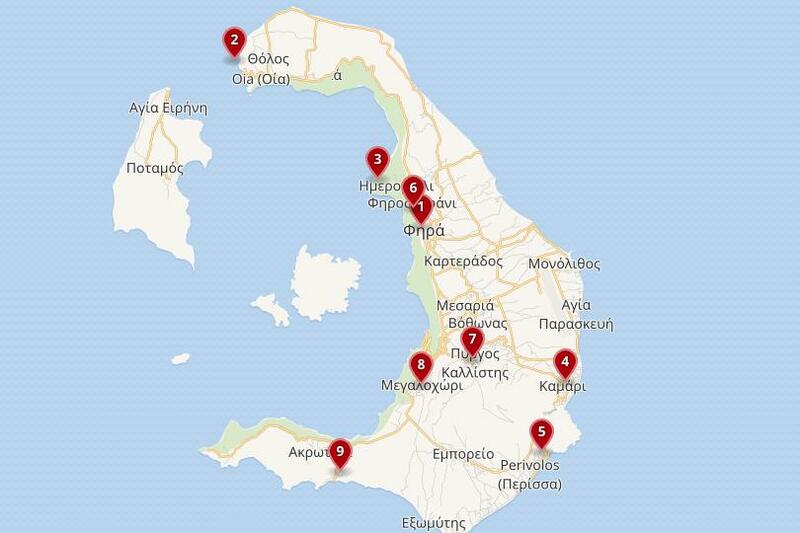 Tucked away on the South West coast, far away from lots of places on the island, Akrotiri is developing quickly; in recent years it has seen lots of excellent hotels open up in the area. 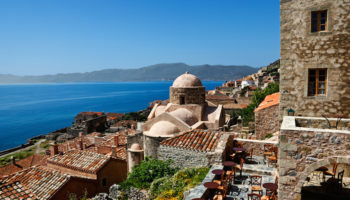 However, the village remains largely unspoiled and less touristy than the rest of the island, meaning better value for money but all of the luxury. Akrotiri has some incredible coastal views along its largely undeveloped beaches, which are especially beautiful at sunset. 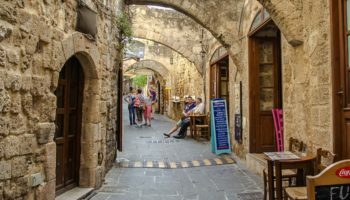 The local tavernas serve up some of the island’s best fish for tasty evening meals; the village is also home to one of the island’s most interesting sites, the Akrotiri Excavations and Akrotiri Castle. 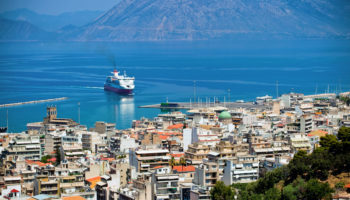 If you want to travel to other towns from Akrotiri you will need a car – from Akroti it’s around a twenty-five minute drive to Fira, but the island is fantastic to explore by car and there are many adventures to be had. Kokkinos Villas – Sometimes a simple stay is all you want; at Kokkinos Villas, that is what you’ll get. It may be a simple, Cycladic whitewashed building, but the views from the upgraded rooms at this 3-star offering are still incredible: a vista of Santorini’s caldera may be all you want, and this is what you’ll get. The outdoor pool here also boasts sea views, making this place extra picturesque. Breakfast is included at this low key hotel; plus Red Sand beach is a two-kilometer walk away.